Good health is hugely important to New Zealanders. We have a strong Government-funded public health service which gives our families peace of mind – knowing that the care they need will be there, when they need it. As Minister of Health, I am committed to getting the most out of every health dollar and providing New Zealanders with high quality healthcare as close to their homes as possible. We are making a lot of progress in improving health services. Our 20 District health boards (DHBs) are employing more doctors and more nurses than ever before. More patients are getting the operations they need, sooner. We’re harnessing the benefits of bulk purchasing and getting more from our health dollars. Our hospital wards are becoming more productive and efficient. And there’s a much greater focus on preventing illness through high immunisation rates. Health and disability services in New Zealand are delivered through a large, complex and dynamic network of organisations and people, all of which play a role in contributing to New Zealanders living healthier, more independent lives. The devolved nature of the system means that responsibility and authority for service funding and planning occurs at national, regional and local levels. DHBs are the largest funders and providers of health services. Around 75% of Vote Health funding is administered by DHBs. They are responsible for planning, managing, providing and purchasing services for the populations of their districts and regions, including services delivered in communities such as primary healthcare, residential services, home support and community care services. The majority of these communitybased services are delivered by non-government health providers, including Maori and Pacific providers. The government has six high impact, high return health targets. Three targets focus on preventative health: increased immunisation, better help for smokers to quit and more heart and diabetes checks. The other three are focused on improving hospital services: shorter stays in emergency departments, improved access to elective surgery, shorter waits for cancer treatment. The targets, which rank how our DHBs are performing, are published in national newspapers every quarter so the public can see how their local health services are performing. Since the introduction of these targets in 2009, we have made significant improvements to health services and more New Zealanders are now satisfied with the care they receive from public hospitals. We continue to invest in frontline health services. Despite the constrained fiscal environment, New Zealand is one of only a few OECD countries to have increased its total health spending in recent years. Overall, the New Zealand health and disability system is performing well. Life expectancy, a key measure of health status, continues to rise and almost 90% of New Zealanders report that they are in good health. New Zealand’s Mãori name is Aotearoa, meaning ‘Land of the Long White Cloud’. 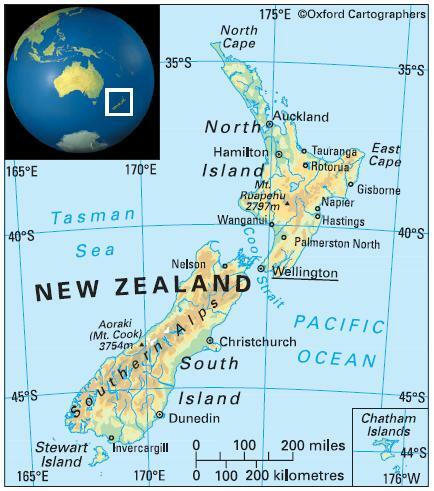 A well-watered and fertile mountainous island country in the South Pacific, New Zealand consists of two large islands (North Island and South Island), Stewart Island and a number of offshore islands. It is somewhat isolated, being about 1,600 km east of Australia, the nearest land mass. Other neighbouring countries are Vanuatu and Tonga. Temperate marine climate influenced by the surrounding ocean, the prevailing westerly winds and the mountainous nature of the islands. The weather tends to be changeable. Winds can be very strong, sometimes damaging buildings and trees. Rain, sometimes very heavy, occurs throughout the year. Cold southerly winds bring snow in winter, sometimes in spring. In Wellington, yearly average rainfall is 1,270 mm (143 mm in July, and averaging 87 mm from November to February); average January temperature is 13-20°C and July temperature 6-11°C. Most of the country experiences at least 2,000 hours of sunshine annually. In recent years, weather patterns have been affected by La Niña and El Niño; some unusually high temperatures have been recorded; and drought and unusually heavy rainfall have occurred. The most significant environmental issues are deforestation and soil erosion, and the impact on native flora and fauna of species introduced from other countries. 4,460,000 (2012); 86 per cent of people live in urban areas and 32 per cent in urban agglomerations of more than a million people. The population growth rate stood at 1.2 per cent p.a. between the years of 1990 and 2012. In 2012 the birth rate was 14 per 1,000 people (22 in 1970) and life expectancy 81 years (71 in 1970). The 2006 census recorded 2,609,592 people of European origin (65 per cent); 565,329 people of Polynesian (Mãori) descent (14 per cent); 265,974 Pacific Island Polynesians (6.6 per cent), mostly from Samoa (131,103), Cook Islands (56,895) and Tonga (50,478); some 139,728 Chinese (3.5 per cent); and 97,443 Indians (2.4 per cent). About 75 per cent of people live in North Island, of which the average population density is 24 per sq km (South Island: six per sq km). New Zealand is classified as a high-income economy by the World Bank.